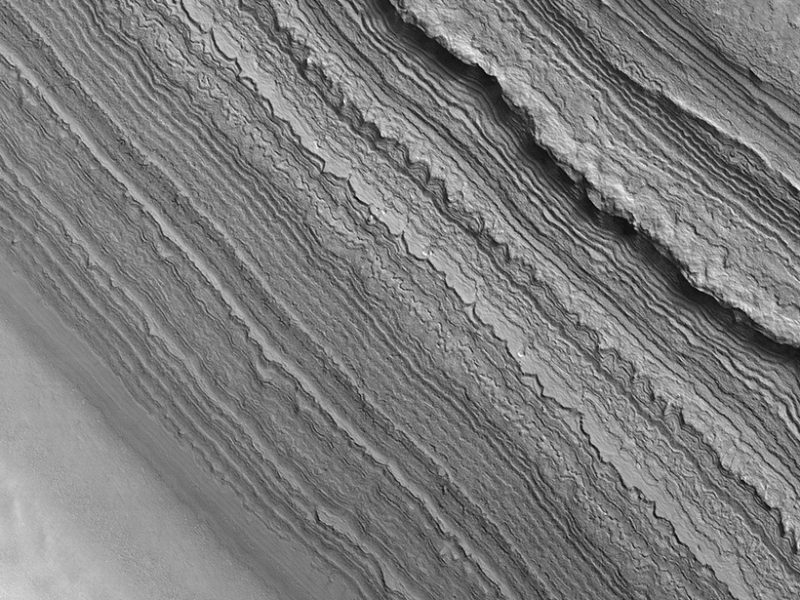 A paper in Geophysical Research Letters (2017), titled “A subsurface depocenter in the South Polar Layered Deposits of Mars” by J. L. Whitten1 , B. A. Campbell1 , and G. A. Morgan discusses many layers of alternating dust and ice that cover an area the size of Alaska at Mars’ south pole, designated its’ South Pole Layered Deposits (SPLD). Consistent with the uniformitarian assumption of geology, they interpret these layers as a record of the climate history of Mars over at least the last 7–100 Myr. As discussed in a number of posts on this site, Cyclic Catastrophism explains that Mars was captured in a geostationary orbit of the Earth for 14.4 years and then released into a planetary ‘resting’ orbit for 15.6 years and that this cycle was repeated ninety-nine or one hundred times, (3687 to 687 BC). The most significant aspect of these capture periods relative to the SPLDs, was that during each capture period, called a kalpa in the RgVeda and an inundation in Egypt, the entire Martian lithosphere was forced to rotate with its north pole facing the Earth, therefore its south pole being exposed to tropical sunlight every day. At each release its lithosphere returned to its normal orientation, allowing the return of normal freezing weather at its south pole. While the northern hemisphere of Mars was blasting all its life-supporting materials to the Earth, including its water during each kalpa, its south pole became a desert. These repeated cycles produced the equally thick, rythmic deposits of ice and dust at Mars south pole shown in Figure 1. ~ by Angiras on September 20, 2018.